from Italian Easy: Recipes from the London River Cafe, p. 138. When I see something fresh and unusual at the market, I am confident that one of my cookbooks will tell me what to do with it. A few days ago, I saw fresh, whole sardines in the seafood case. In this case, I was certain I had a recipe in Rose Gray’s Easy Italian Cooking, which I have used only occasionally. The recipe is drop-dead simple. Eating the first without ingesting small bones turns out to be a touch trickier — but not so tricky that it would discourage me from making them again. I have to confess that I broke the Law According to Michael Pollan (LAMP): I bought cherry tomatoes at Costco in January. Printed on the container was the claim that they had been grown in the United States. This year? Where in this country was it hot enough in the last month to grow cherry tomatoes? My conscience vibrated with alarm for a few seconds. However, despite my moral qualms, I bought them. I have to say, they weren’t horrible. That’s the best I can say. The sardines were tasty and distinctly sardine-y in flavor. The saltiness of the olives complemented the flavor of the sea. The lemon brightened the whole dish like a ray of sun. Removing the head and lift the spinal column of bones from between the facing fillets of flesh were simple. Shadowcook: About the ingredients, 24 sardines seems like a lot for even four people, but perfect for eight. I bought two for myself and it was plenty. Judge for yourself how many cherry tomatoes and olives you want. Pierce the tomatoes with a fork. Toss with olive oil, season and bake for 15 minutes. Pit the olives and grate the peel of 2 lemons. 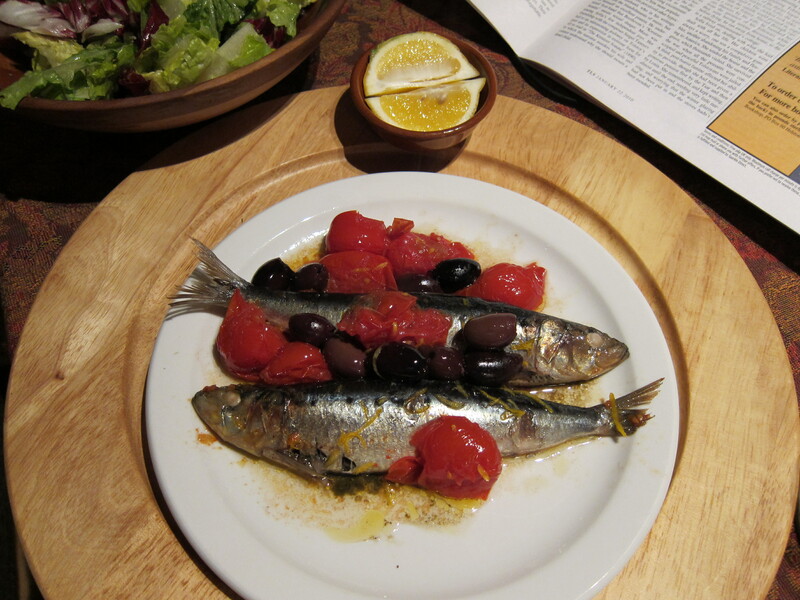 Use a baking dish large enough to hold the sardines in one layer, and drizzle with olive oil. Place the sardines in the dish, side by side, and season. Sprinkle over the lemon zest, olives, and tomatoes and drizzle with olive oil. Bake for 10 minutes. Serve with lemon. Shadowcook: It really is that simple.